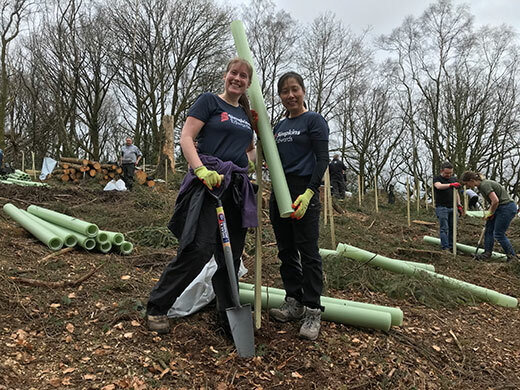 We teamed up with Premier Paper, the Woodland Trust and Natural England, for one of a number of Carbon Capture tree planting days planned for 2019. Nine thirty AM, Thursday 21st March 2019, the morning is slightly overcast, bird song and the river Bovey adding to the ambience on what is a surprisingly warm spring morning. The tree planting team gathered at the entrance to Pullabrook Woods in the Dartmoor National Park before embarking on the fifty minute trek to the day’s planting site. This enchanting cluster of three woodlands, Hisley Wood, Houndtor Wood and Pullabrook Wood, lies in the south east corner of Dartmoor National Park and contrasts with the starker landscape that inspired Sir Arthur Conan Doyle’s Hound of the Baskervilles. Together with Trendlebere Down and Yarner Wood (owned and managed by Natural England) it forms part of the East Dartmoor National Nature Reserve. The Woodland Trust and Natural England work closely to manage this area. After a quick introduction, hot drinks and breakfast rolls we ventured out into the planting site; an area that was felled in the 60’s and turned into a plantation for beech and spruce. Now the Woodland Trust and Natural England aim to restore the area to mixed native broadleaf helping to increase wildlife and diversity in the region. A total of 600 saplings were planted, a mixture that mainly consisted of hazel as well as a few oak, complete with supports and wildlife protection tubes before the team broke for lunch; freshly made local pasties and soup. The trees planted at Bovey Valley are part of a big project to expand the site with new native woodland whilst maintaining the beautiful, ancient woodland that so many come to enjoy whether dog walking, running, exploring, nature watching or picnicking; for now and for years to come. Featured in the photo is Marketing Manager, Sharon Roberts and Accountancy & Tax Clerk, Bickie Thompson.